Thanks this time to Jim Thompson, Editfish, Terry Foster, Adam Latz, Peter Bonnett, Adam Orford, Bill Mullins, Chinmay, Papapenguin, David and John Neilson. This isn’t an actual space shuttle stack. This is a mockup at the visitor’s center. The complex Southwest of the shuttle in the picture is all the visitor’s center. The rocket park is on the far west side and the IMAX theatre right in the center slightly North. love it, had to have a wee play with the zoom function at that location. Thought you all might want to know: Look at the Vehicle Assembly Building (the huge, bright white building where they put together the space shuttle and its boosters). Now look just a few inches NW of that, where there’s a relatively small, nondescript grey building. It’s long and it has four sections. It’s right above the building that’s shaped like a microphone, which has two yellowish square buildings next to it. That’s where they keep the shuttles between flights. 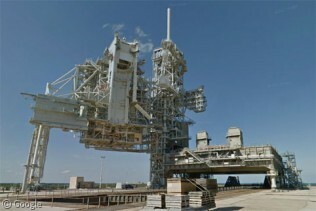 And directly to the north of the VAB you can see both the crawler that takes the shuttle out to the launchpads and, beside it, the platform which it lifts, upon which the shuttle stack is assembled. Here is another space shuttle. Is it real? As a rule, you won’t really see the shuttle on it’s own unless it’s rolling just outside the VAB from OPS or coming in from the runway after landing. That is the lifesize mock up of an orbiter, external tank and solid rocket boosters at Kennedy Space Center Visitors Complex. Altho not real it is pretty impressive. You can go inside the orbiter to see how small the crew module is that the astronauts live in while in orbit. Hopefully when NASA retires the shuttles in 2010 the Visiters Center will get a real shuttle to display. That would be cool. I was actually inside the shuttle Columbia in California and now work at KSC. And the orbiters are worked on in the OPF Bay 1 2 or 3, not the OPS. Also the other shuttle mentioned is at the Astronaut Hall of Fame six miles east of the Visitors Center.